Arthur’s Seat is Edinburgh’s highest hill, visible for miles around. The rocky slopes and cliffs of Arthur’s Seat and Salisbury Crags are part of Holyrood Park and provide a spectacular natural backdrop to the city. The park, Edinburgh’s wildest and biggest open space, is a place of sanctuary from the crowded streets and a piece of countryside within the city limits. Arthur’s Seat is an extinct volcano, which erupted around 340 million years ago. At that time, Scotland was a very different place, located close to the Equator. 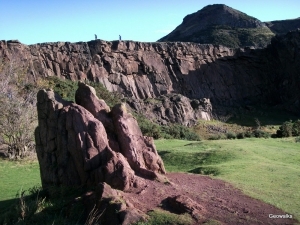 The rocks of Holyrood Park give us some clues about what it was like in the past – there are layers of sandstone formed in shallow lagoons close to the sea, layers of volcanic ash created by many explosive eruptions of the volcano, and lava flows representing quieter eruptions. In the hundreds of millions of years since it stopped erupting, the volcano has been buried beneath other rocks, then gradually exposed at the surface and eroded so that now less than half remains. This means that we can now walk right through the heart of the volcano and see rocks created underground when the volcano was erupting, and also walk through the crater area and across some of the lava flows. Holyrood Park holds a special place in the history of science, for it was here in the late 18th century that James Hutton found evidence to support his theories about the workings of the Earth. 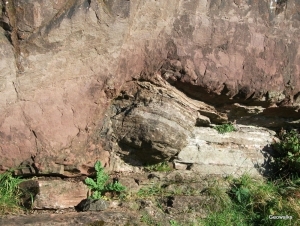 At Salisbury Crags, he observed igneous and sedimentary rocks and understood that they had been formed at different times by different processes. He suggested that the Earth was very old, and continually changing; a startling new idea that changed forever the way people thought about our planet, and influenced other scientists such as Charles Darwin. James Hutton is now recognised as the ‘father of modern geology’. The Rock Opera project explores the history, geology and stories of Arthur’s Seat and James Hutton in Holyrood Park with a short animated film, smart phone app, games and resources for teachers – visit www.rockopera.org.uk.